Dior Cheng Yi Kin, Jordan Chan Siu Chun, Michael Tse Tin Wa, Chin Kar Lok, Jerry Lamb Hiu Fung recently worked on the Chin Kar Lok directed film WONG GUM HING DAI (GOLDEN BROTHERS) in Budapest, Hungary. Eric Tsang Chi Wai also starred. Investor Jackie Chan after attending the 2017 China Day Film Festival opening ceremony went to visit the brothers on the set. Jackie Chan posted a photo. 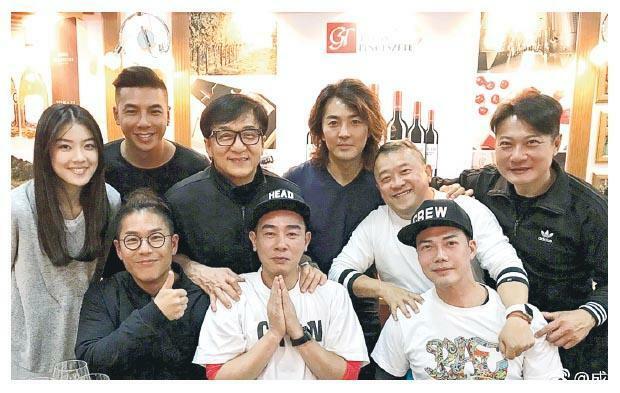 He said, "Having dinner here with the team and the Jackie Chan Stuntman Association brothers. In the end everyone came to drink with me, everyone toasted me with a glass of Hungarian sweet wine and I ended up drunk. I wish a smooth production for everyone!"